According to a study by IHS iSuppli, excessive semiconductor inventory in the first quarter helped the semiconductor industry avoid a critical shortage of components. Initially, people were worried that the Japanese earthquake and tsunami would bring about a serious shortage of components. At the end of the first quarter of 2011, semiconductor suppliers' semiconductor inventory, excluding memory vendors, was estimated at 82.0 days, an increase of 3.3 days from 79.4 days in the fourth quarter of 2010 and an increase of 10.8 days from the same period of last year. 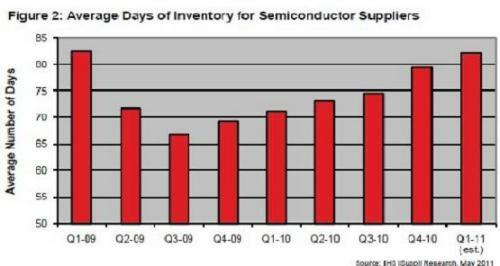 Overall, the average number of inventory days (DOI) for semiconductor channels has continued to rise steadily since the third quarter of 2009. At the same time, the inventory amount has been increasing since the first quarter of 2010, as shown in the figure. The amount of inventory in the first quarter of this year is estimated at USD 27.2 billion. It now appears that manufacturers are fortunate to increase their inventory during the off-season period from the fourth quarter of 2010 to the first quarter of 2011 because it creates a 2-4 week buffer for raw materials, processed products and finished products. IHS Corporation believes that the Japanese disaster occurred on March 11 and was in the end of the first quarter. Therefore, the direct impact of the supply chain in the first quarter was limited. The impact of the Japanese disaster on the second quarter may also be less than previously expected. Many semiconductor factories that were initially damaged or underpowered have resumed normal operations, reducing the negative impact on semiconductor sales in the second quarter. Plants that have been severely damaged have already transferred production operations to other factories or external foundries. For example, Renesas Electronicsâ€™ damaged Naka plant shifted its manufacturing operations to other locations shortly after the earthquake. At the same time, the company plans to return to the pre-quake production level by the end of July. Inventories rose in the second quarter, but the future outlook has become more blurred. IHS believes that inventory levels of semiconductor suppliers are expected to increase further in the second quarter. This will be the supplier's intention to prepare for the growth of demand in the second and third quarters, and semiconductor inventory growth is not necessarily out of fear of component shortages. However, some end products have shown different trends, including monitors for televisions, monitors, and laptops. Branded electronics manufacturers are increasing their reserves to prevent problems in the supply chain. Despite the recent rise in inventories, the outlook for the future has become somewhat blurred. Once internal inventory is reduced, the channel may not be able to replenish inventory in time to meet all terminal needs, thereby posing risks to participants in the supply chain. Japanese disasters also prompted manufacturers to re-examine inventory policies, and those who originally insisted on a JIT inventory strategy reassessed potential order losses. This loss may be attributed to the lack of a certain component or raw material that causes its product to fail to ship, although JIT can achieve cost savings. Vendors may find that the disaster caused the customer to start using a second source and may lose orders for certain components from then on. Time will tell us whether the recent global events such as Japan's disaster have given birth to a long-term approach, not just an expedient measure: keeping extra inventory as a preventative measure to prevent accidents from disrupting market supply.